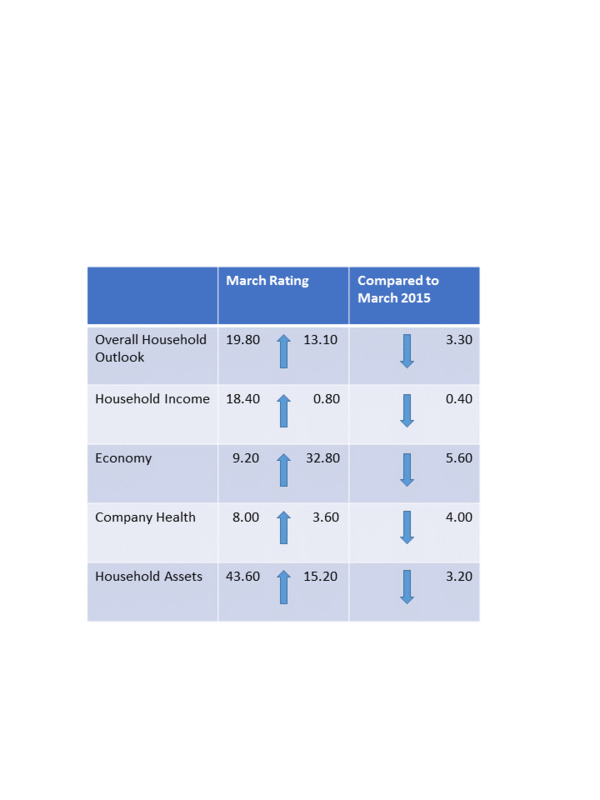 The Spectrem Affluent Household Outlook gained 13.1 points in March to 19.80. This is its highest reading since last November, but is down 3.3 points from March 2015. The Spectrem Affluent Household Outlook is our monthly measure of affluent investor confidence over the next 12 months in four financial factors that impact their daily lives. It is one of the drivers of the Spectrem Affluent Investor Confidence Index (SAICI®), which is published each month in our High Net Worth Advisors newsletter (click here to preview and purchase). Household Assets, one of the Outlook categories, is at 43.60 points, a 15.2-point gain from the previous month. Household Income also posted a double digit gain, 18.40 points, but down roughly 13 points from the same period last year. The Economy surged 32.80 points from February to reach positive territory for the first time since November 2015. At 9.20 points, this is the highest reading for the Economy since July 2015. However, it is down four points from March 2015. Company Health gained 3.6 points in March. Our data analyzes the Spectrem Affluent Household Outlook by Millionaire and non-Millionaire households. The Spectrem Affluent Household Outlook for non-Millionaires gained 14.34 points in March to 17.82 points, an eight-month high, while The Outlook for Millionaires gained 11.53 points. in March to 21.30 points., a four-month high. Non-Millionaire indicated a surge of confidence in the Economy, which gained 37.95 points. to 9.26, a five-month high. Millionaire confidence in the Economy increased 27.90 points. to 9.15, an eight-month high March is the first time since November 2015 that all the Affluent Household Outlook components for Millionaires and non-Millionaires have been in positive territory. Likewise, Affluent Democrats have significantly higher confidence in the Economy (39.13 points) than Independents (2.47 points) and Republicans (-4.30 points), while Affluent Republicans are more confident in their Household Assets and Household Income than their Independent and Democrat counterparts. The March SAICI gained 6 points in March. Instituted in February 2004, our indices measure the investment confidence and outlook of the 16MM households in America with more than $500,000 of investable assets (SAICI), and those with $1MM or more (SMICI).